In the late 19th century Americans began collecting a variety of souvenirs and souvenir like artifacts. 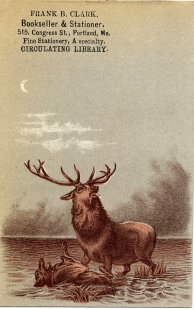 These collections were stimulated by the 1876 Centennial Exposition in Philadelphia and the 1893 World's Columbian Exposition in Chicago. 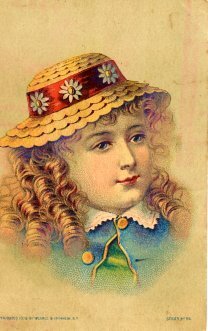 Trade cards which advertised a business and included an attractive illustration were highly collectible. 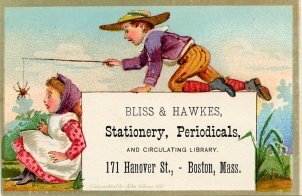 One of the businesses that used trade cards to advertise were circulating libraries. 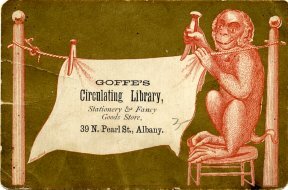 Circulating libraries were for-profit rental libraries that were started in the United States in the second half of the 18th century. 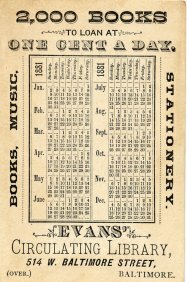 They were an alternative to the subscription and membership libraries that preceded free public libraries. 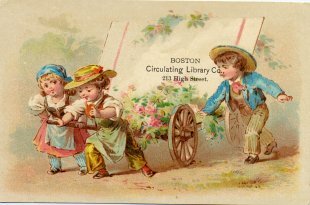 The definitive book on circulating libraries is David Kaser's A Book For A Sixpence: The Circulating Library in America (Beta Phi Mu, 1980). 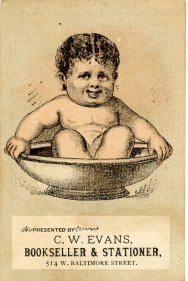 The Trade Card Place is a website which contains extensive information about trade cards and the current collecting of those cards. 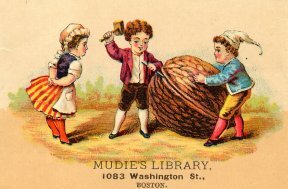 I have assembled a modest collection of circulating library trade cards, some of which are depicted below. 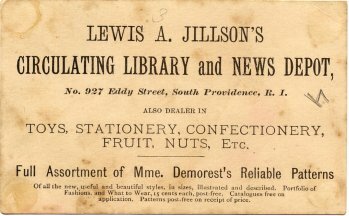 Lewis A. Jillson's Circulating Library and News Depot in South Providence, RI sold a variety of products in addition to lending books.